Eko Sulistyono Department of Agronomy and Horticulture, Faculty of Agriculture, Bogor Agricultural University, Jl. Meranti Kampus IPB Darmaga, Bogor 16680, Indonesia. Yonny Koesmaryono Department of Geophysic and Meteorology, Faculty of Math and Natural Sciences, Bogor Agricultural University, Jl. Meranti Kampus IPB Darmaga, Bogor 16680, Indonesia. Climate change is believed to increase the intensity and the frequency of extreme weather events in reference to strong winds and heavy precipitations. The extreme event is defined as strong wind at speed of 50 km.h-1 and rain fall intensity 10 to 20 mm.h-1 or more . This condition is detrimental to rice production as this may lead to lodging and flooding which normally occurs during the grain filling stage to harvesting resulting in lower yield and grain quality. The. Simultaneous extreme events and critical rice growth occured more frequently due to increasing cropping season within a year in Indonesia. Therefore, it is important to mitigate and develop adaptation strategies in order to sustain rice production. Efforts to adapt to these extreme environmental conditions are mostly based on genetics and agro ecological approaches. Genetically, rice with strong hills, high aerodynamic with low water retention is desired. Agro-ecological manipulation is conducted through wind break application, planting arrangement to facilitate better sunshine penetration, to manage water level and planting calendar. Availability of weather station in the field is important to improve mitigation and continuous adaptation strategy against extreme weather events. Eko Sulistyono, Department of Agronomy and Horticulture, Faculty of Agriculture, Bogor Agricultural University, Jl. Meranti Kampus IPB Darmaga, Bogor 16680, Indonesia. Department of Agronomy and Horticulture, Faculty of Agriculture, Bogor Agricultural University, Jl. Meranti Kampus IPB Darmaga, Bogor 16680, Indonesia. Yonny Koesmaryono, Department of Geophysic and Meteorology, Faculty of Math and Natural Sciences, Bogor Agricultural University, Jl. Meranti Kampus IPB Darmaga, Bogor 16680, Indonesia. Department of Geophysic and Meteorology, Faculty of Math and Natural Sciences, Bogor Agricultural University, Jl. Meranti Kampus IPB Darmaga, Bogor 16680, Indonesia. Ayoade, J.O. (1983). “Introduction to Climatology for the Tropics”. John Willey and Son. New York. Balitbang Kementan (Badan Penelitian dan Pengembangan Pertanian Kementerian Pertanian). (2011). “General Guideline on Adaptation of Climate Change in Agriculture Sector. Indonesian Agency for Agriculture Research and Development, Ministry of Agriculture Republic of Indonesia”. 67pp. Jakarta. Barry, R.G., and Chorley R.J. (2010). “Atmosphere, Weather, and Climate”. 9th edition. London. Bhiah, K.M., Guppy, C., Lockwood, P., and Jessop, R. (2010). Effect of potassium on rice lodging under high Nitrogen nutrition In “Soil Solution for a Changing World”, Brisbane, Australia. 19th World Congress of Soil Science. BMKG (Badan Meteorologi Klimatologi dan Geofisika). (2010). “Standard Operational Procedure Implementation of Early Warning, Reporting and Information Dissemination”. Peraturan BMKG No.009 Tahun 2010. Agency of Meteology Climatology and Geophysics, Republic of Indonesia. Jakarta. BNPB (Badan Nasional Penanggulangan Bencana). (2012). “General Guideline for Disaster Risk Evaluation”. Peraturan BNPB No. 02 Tahun 2012. National Agency for Disaster Management, Republic of Indonesia, Jakarta. BPS (Badan Pusat Statistik). (2013). “Agricultural Land Conversion”. http://www.bps.go.id. [March 1, 2017]. Chandler, J.R.F. (1969). Plant morphology and stand geometry in relation to nitrogen. In “Physiological Aspect of Crop Yield” (J.D. Eastin, F.A. Haskins, C.Y. Sullivan, and C.H.M. Bavel, eds. ), pp. 265–285. American Society of Agronomy, Madison, Wisconsin. Cornelis, W.M., Erpul, G., and Gabriels, D. (2004). The ICE Wind tunnel for wind and water interaction research. In “Wind and Rain Interaction in Erosion (Trmp 50)” (S.M. Visser, and W.M. Cornelis eds. ), pp. 59–68. Tropical Resource Management Papers. Wageningen University and Research Centre, Wageningen, The Netherlands. De Datta, S.K. and Zarate, A.C. (1970). Environmental conditions affecting growth characteristics, nitrogen response and grain yield of tropical rice. Biometeorology 4, 71–89. Dengel, G.O.F. (1956). “Fundamental on Climate”. Wolters JB. Jakarta-Gronihgen. Duwayri, M., Tran, D.V., and Nguyen, V.N. (2000). Reflection on Yield Gaps in Rice Production: How to Narrow the Gaps. www.fao.org/DOCREP/003/X6905E [March 1, 2017]. Grist, D.H. (1975). “Rice”. Longman Group Ltd. London. Hairmansis, A., Supartono, B., Kustianto, Suwarno, and Pane, H. (2012). Breeding and genotype development of new rice type tolerant to flooding Inpara 4 and Inpara 5 for area vulnerable to flooding. Jurnal Litbang Pertanian 31, 1–7. Hamed, Y., Albergel, J., Pépin, Y., Asseline, J., Nasri, S., and Zante, P. (2002). Comparison between rainfall simulator erosion and observed reservoir sedimentation in an erosion-sensitive semi arid catchment. Catena 50, 1–16. Hayashi, K., Tatuno, M., Nagabayashi, H., Hasimoto, H., and Tada, T. (2011). Fluid forces acting on a tree. Journal of Japan Society Civil Engineers 67, 569580. DOI:10.2208/jscejam.67.I_569. Hidayat, R., and Kizu, S. (2009). Influence of the medden-julian oscillation on Indonesian rainfall variability in Austral summer. International Journal of Climatology 10. Hitaka, H. (1969). Studies on lodging of rice plant. Japan Agricultural Research 4, 1–6. Islam, M.S., Peng, S., Visperes, R.M., Ereful, N., Bhuiya, M.S.U., and Julfiquar, A.W. (2007). Lodging-related morphological trait of hybrid rice in a tropical irrigated ecosystem. Field Crop Research 101, 240–248. Kashiwagi, T., Sasaki, H., and Ishimaru, K. (2005). Factor responsible for decreasing sturdiness of the lower part in lodging of rice (Oryza sativa L.). Plant Production Science 8, 166–172. Kashiwagi, T., Togawa, E., Hirotsu, N., and Ishimaru, K. (2008). Improvement of lodging resistance with QTLs for stem diameter in rice (Oryza sativa L.). Theoretical and Applied Genetics 117, 749757. Kashiwagi, T., Madoka, Y., Hirotsu, N., and Ishimaru, K. (2006). Locus prl5 improves lodging resistence of rice by delaying senescense and increasing carbohydrate reaccumulation. Plant Physiology and Biochemistry 44, 152–157. Kementan (Kementerian Pertanian). (2016). “Rice Cultivation using Jajar Legowo Super”. 58pp. Indonesian Agency for Agriculture Research and Development, Ministry of Agriculture Republic of Indonesia. Jakarta. Kono, M., and Takahashi, J. (1964). The effect of wind force with reference to lodging of paddy rice. Soil Science and Plant Nutrition 10, 20–27. DOI: 10.1080/00380768.1964.10431141. Kuroda, E., Ookawa, T., and Ishihra, K. (1989). Analysis on different of dry matter production between rice cultivar with different hight in relation to gas diffusion inside stand. Journal of Crop Science 58, 374–382. Lang, Y., Yang, X., Wang, M., and Zhu, Q. (2012). Effects of lodging at different filling stages on rice yield and grain quality. Rice Science 19, 315-319. Li, J., Zhang, H.C., Gong, J.L., Chang, Y., Dai, Q.G., Huo, Z.Y., Xu, K., and Wei, H.Y. (2011). Effect of different planting methods on the culm lodging resistance of super rice. Journal of Integrative Agriculture 44, 2234–2243. Matsubayashi, M., Ito, R., Takase, T., Nomoto, T., and Yamada, N. (1963). “Theory and Practice of Growing Rice”. 502 pp. Fuji Publishing Co. Ltd. Tokyo. Meyer, L.D., and McCune, DL. (1958). Rainfall simulator for runoff plots. Journal of Agricultural Engineering 10, 1085–1089. Nurlambang, T., Kusratmoko, E., Ludiro, D., Harmantyo, D., Halide, H., Sobirin, Rahmawati, F., Rahaningtyas, N.S., Rustanto, A., Zakir, A., et al. (2013). Management of extreme weather disaster in Indonesia. In “Prosiding Seminar Nasional Riset Kebencanaan”, pp 8, Mataram, Indonesia. Ookawa, T., Hobo, T., Yano, M., Murata, K., Ando, T., Miura, H., Asano, K., Ochiai, Y., Nishitani, R., Ebitani, T., et al. (2010). New approach for rice improvement using a pleiotropic QTL gene for lodging resistance and yield. Nature Communications 1. DOI: 10.1038/ncomms1132. Ookawa, T., Inoue, K., Matsuoka, M., Ebitani, T., Takarada, T., Yamamoto, T., Ueda, T., Yokoyama, T., Sugiyama, C., Nakaba, S., et al. (2014). Increased lodging resistance in long-culm, low-lignin gh2 rice for improved feed and bioenergy production. Research Gate Scientific Reports 4, 6567. DOI: 10.1038/srep06567. Ookawa, T. and Ishihara, K. (1992). Varietal difference of physical characteristics of the culm related to lodging resistance in paddy rice. Japan Journal of Crop Science 61, 419–429. Peng, S., Huang, J., Sheehy, J.E., Laza, R.C., Visperas, R.M., Zhong, X., Centeno, G.S., Khush, G.S., and Cassman, K.G. (2004). Rice yields decline with higher night temperature from global warming In Proceeding of the National Academy of Science 101, 9971–9975. Rejekiningrum, P. (2013). Optimation model of rice surplus to determine national food security level In Prosiding Seminar Nasional Matematika, Sains, dan Teknologi 4, A62–A75. Sabaruddin L. (2014). “Agroklimatologi: Aspek-aspek Klimatik untuk Sistem Budidaya Tanaman”. Alfabeta Bandung. Sanguesa, C., Arumi, J., Pizarro, R., and Link, O. (2010). A rainfall simulator for the in situ study of superficial runoff and soil erosion. Chilean Journal of Agricultural Research 70, 178–182. Santosa, E., Dulbari, Agusta, H., Guntoro, D., and Zaman, S. (2016). Phenomenon of lodging and its implication on improvement of rice adaptive to extreme weather in Indonesia. In “Prosiding Strategi Pemuliaan dalam Mengantisipasi Perubahan Iklim Global”, pp. 45–53. Pekanbaru-Riau, Indonesia. Seminar Nasional Perhimpunan Ilmu Pemuliaan Indonesia (In Indonesian). Setter, T., Laureles, E., and Mazaredo, A. (1997). Lodging reduce yield of rice by self-shading and reduction in canopy photosynthesis. Field Crops Research 49, 95–106. Simarmata, T., and Joy, B. (2011). Technology rice land recovery and sustainable increase rice productivity based on straw compost and biodecomposer in Indonesia. In “Proceeding Seminar teknologi pemulihan kesehatan lahan sawah dan peningkatan produktivitas padi”, pp 16. Lampung, Indonesia. Sosrodarsono, S., and Takeda, K. (1983). “Hidrology for Irrigation”. Pradnya Paramita, Jakarta. Sridevi, V., and Chellamuthu, V. (2015). Impact of weather on rice – A review. International Journal of Applied and Research 1, 825-831. Sterling, M., Baker, C.J., Berry, P.M., and Wade, A. (2003). An experimental investigation of the lodging of wheat. Agricultural and Forest Meteorology 119, 149–165. Tadrist, L., Julio, K., Saudreau, M., and de Langre, E. (2015). Leaf flutter by torsional galloping: experiments and model. Journal of Fluids and Structures 56, 1–10. DOI: 10.1016/j.jfluidstructs.2015.04.001. Tjasyono, B.H.K. (2004). “Climatology”. 2nd edition. Institut Teknologi Bandung. Bandung, Indonesia. Trnka, M., Rötter, R.P., Ruiz-Ramos, M., Kersebaum, K.C., Olesen, J.E., Žalud, Z., and Semenov, M.A. (2014). Adverse weather conditions for European wheat production will become more frequent with climate change. Nature Climate Change 4, 637-643. USDA [United States Department of Agriculture]. (2012). Indonesia: Stagnating Rice Production Ensures Continued Need For Imports. http: //www.pecad.fas.usda.gov /highlights /2012/ 03 /Indonesia_rice. Wadsworth, R.M. (1959). On optimum wind speed for the plant growth. Annual Botany 23, 195–199. Wischmeier, W.H., and Smith, D.D. (1978). “Predicting Rainfall Erosion Losses - a Guide to Conservation Planning”. Agriculture Handbook No 537. US Department of Agriculture, Washington DC, USA. Yamin, M., and Moentono, M.D. (2005). Selection several rice variety for strong culm and high lodging resistant. Ilmu Pertanian 12, 94-102. Zhang, W., Li, G., Song, Y., Zhang, W., Yang, C., Wang, S., and Ding, Y. (2013). Lodging resistance of super hibrid rice Ylingyou 2 in two ecological regions. Acta Agronomica Sinica 39, 682–692. Zhang, W., Li, G., Song, Y., Liu, Z., Yang, C., Tang, S., Zheng, C., Wang, S., and Ding, Y. (2014a). Lodging resistance characteristics of high-yield rice populations. Field Crops Research 161, 64–74. Zhang, W., Li, G., Yang, Y., Li, Q., Zhang, Z., Liu, J., Wang, S., Tang, S., and Ding, Y. (2014b). Effect of nitrogen application rate and ratio on lodging resistance of super rice with different genotype. Journal of Integrative Agriculture 13, 63–72. Zhang, W., Wu, L., and Wang, S. (2016). 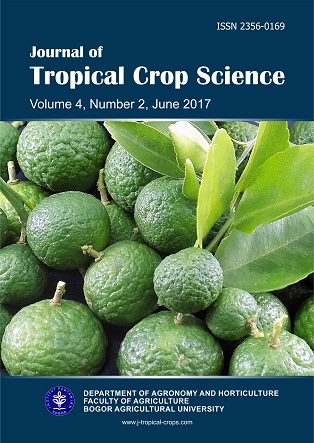 Lodging resistance of Japonica rice (Oryza Sativa L.): morphological and anatomical traits due to top-dressing Nitrogen application rates. Rice 27, 31-35.